... that the Monument to the Ghetto Heroes (pictured), site of Willy Brandt's Warschauer Kniefall in 1970, was made from labradorite intended to be used in monuments in Nazi Germany? ... that the Chaim Potok novel The Book of Lights is based on Potok's exposure to non-Jewish religions as a military chaplain in Korea and Japan? ... that Polish Jewish resistance fighter Vladka Meed was a central source of the 2001 television movie Uprising? ... that most Russian-speakers in the United States are Jewish immigrants from the former Soviet Union? Contribute to this portal, especially the News section. Announce new articles related to Judaism. Explore, edit, and improve articles in Category:Judaism. Join WikiProject Judaism or WikiProject Israel. Explore and help out Portal:Israel and Portal:Kabbalah. Deuteronomy 14:22–16:17: Moses instructed that the Israelites were to set aside every year a tenth part of their harvest. They were to consume the tithes of their new grain, wine, and oil, and the firstlings of their herds and flocks, in the presence of God in the place where God would choose. If the distance was too great, they could convert the tithes or firstlings into money, take the proceeds to the place that God had chosen, and spend the money and feast there. They were not to neglect the Levite in their community, for the Levites had no hereditary portion of land. Moses instructed that every third year, the Israelites were to take the full tithe, but leave it within their settlements, and the Levite, the proselyte, the orphan, and the widow in their settlements could come and eat. Moses instructed that every seventh year, the Israelites were to remit debts from fellow Israelites, although they could continue to dun foreigners. There would be no needy among them if only they kept all God’s laws, for God would bless them. Moses instructed that if one of their kinsmen fell into need, the Israelites were not to harden their hearts, but were to open their hands and lend what the kinsman needed. The Israelites were not to harbor the base thought that the year of remission was approaching and not lend, but they were to lend readily to their kinsman, for in return God would bless them in all their efforts. Moses instructed that if a fellow Hebrew was sold into servitude, the Hebrew slave would serve six years, and in the seventh year go free. When the master set the slave free, the master was to give the former slave parting gifts. Should the slave tell the master that the slave did not want to leave, the master was to take an awl and put it through the slave’s ear into the door, and the slave was to become the master’s slave in perpetuity. Moses instructed that the Israelites were to consecrate to God all male firstlings born in their herds and flocks and eat them with their household in the place that God would choose. If such an animal had a defect, the Israelites were not to sacrifice it, but eat it in their settlements, as long as they poured out its blood on the ground. 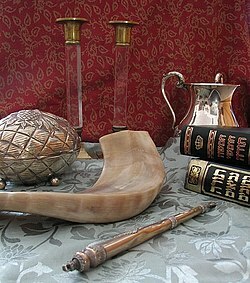 Moses instructed the Israelites to observe Passover, Shavuot, and Sukkot. Three times a year, on those three Festivals, all Israelite men were to appear in the place that God would choose, each with his own gift, according to the blessing that God had bestowed upon him. Numbers 28:19–25: God told Moses that every Passover, for seven days, the Israelites were to present to God the following offerings: two bulls, one ram, and seven lambs as burnt offerings; meal offerings; and a goat as a sin offering. The Weekly Torah portion in synagogues in Israel on Shabbat, Saturday, 22 Nisan, 5779—April 27, 2019—is Acharei.